Soft grunts and the occasional bellow lure guests down a long wooden walkway to the outdoor bar over the Hippo Pool at Keekorok Lodge. When you arrive, at first all you may see are eyes, nostrils and ears. Unable to swim, the third largest animal in the world spends most of its day submerged in the shallow water (where it can touch the bottom) to keep its skin from drying out and burning. When it does emerge from the water during the day, its skin secrets a red mucous, sometimes referred to as “blood sweat” that acts as a both sunscreen and anti-infective (in case of cuts or other skin damage). 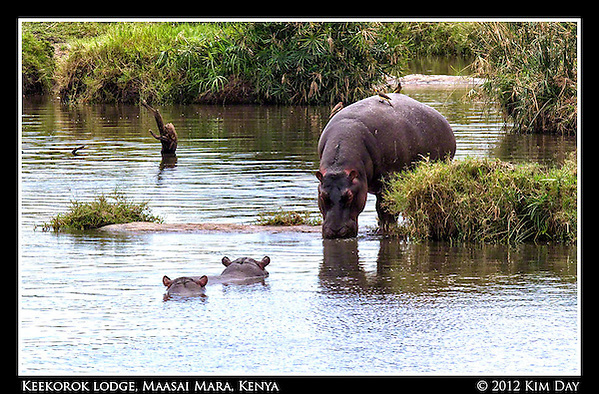 With a little patience, you’ll see the hippos poke their heads out of the water. And if you’re lucky you may see one climb in and out of the water or open up with a big yawn to show its teeth and ward off enemies. 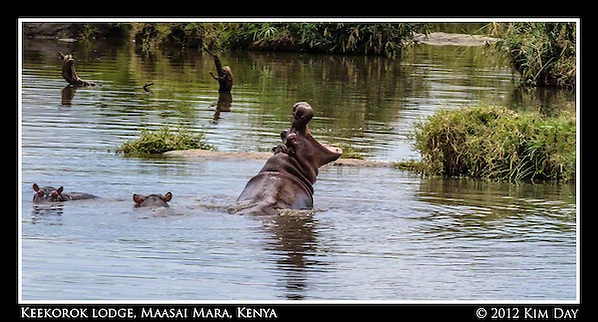 While the hippo may look cute and cuddly in these photos, beware. They are very aggressive if provoked, will attack anything that gets in the way of their path to water and have been known to attack humans. And weighing in at 3,000 pounds (for females) to nearly 10,000 pounds (for bigger males), it is safe to say any up-close, personal encounter will end badly. At night they leave the water to graze on grass (they can eat up to 80+ pounds of grass a night). On our last night at Keekorok, a couple of members of my travel group heard an animal banging up against the door to their room. While tempted to check the source of the sound, they wisely kept the door shut. 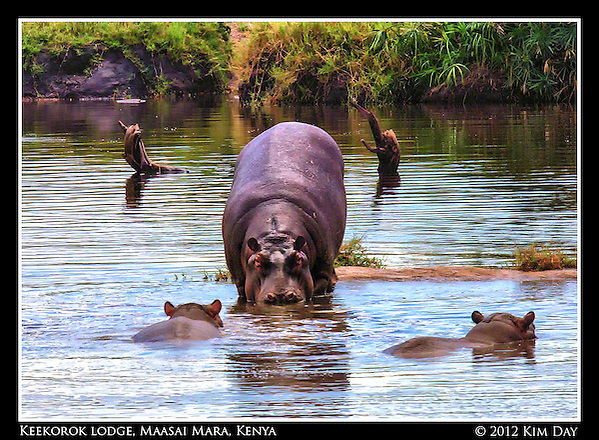 They found out the next morning from one of the night security guards, that one (or more) of the hippos had been wandering the grounds and knocked on their door. A couple of doors down I slept through all of the excitement. This entry was posted on Tuesday, October 9th, 2012 at 10:00 AM. 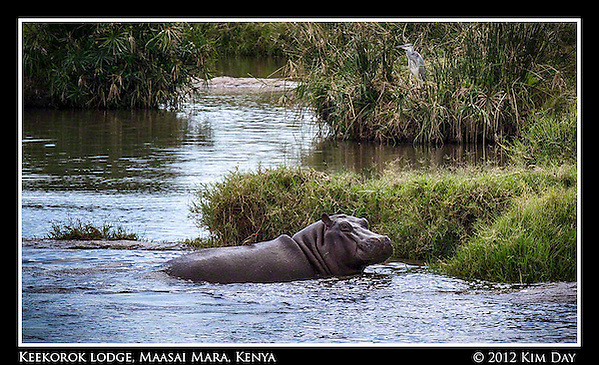 It is filed under Globetrotting: Near and Far, Kenya and tagged with Hippo Pool, Hippos, Keekorok Lodge, Kenya, Maasai Mara, Water Horse. You can follow any responses to this entry through the RSS 2.0 feed. I think they’d both try to eat you if given the opportunity! 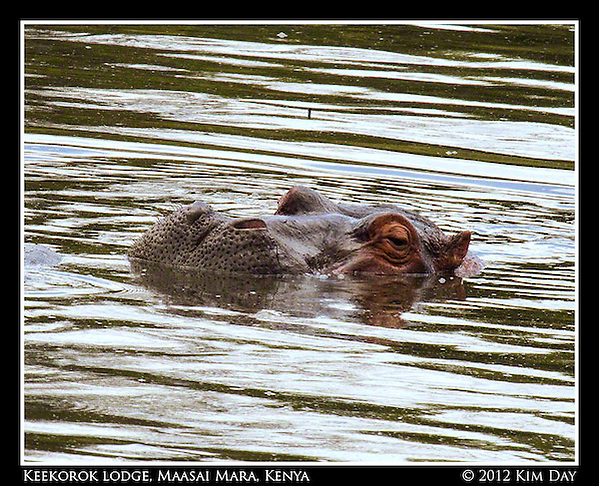 I’ve always had a fondness for hippos for some reason–I remember some sort of dancing purple hippos from my childhood. ok, this is a very different kind of coemmnt, but try to go to youtube and search hippo & impala. i saw this video and it was astounding, especially given the fact that in the wild, hippos are one of the largest causes of human fatalities in africa! can you believe it? i couldn’t. still can’t. i don’t know much of it but want to guess that humans are to blame, bc this one of a hippo coming to the defense of a baby impala is just too amazing. 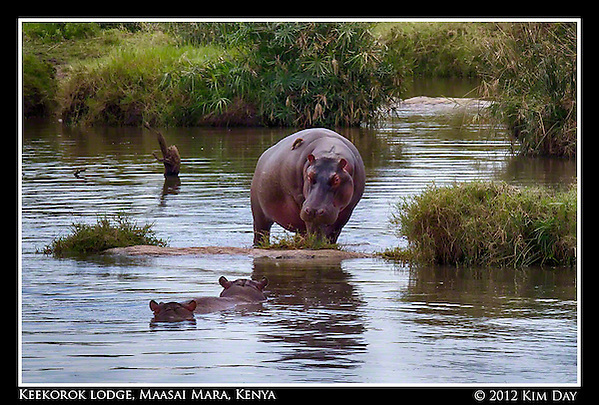 love the hippo photo. and the name: hippopotamus. hippo. c’mon. i’m in a better mood already.